Available on CD or through iTunes. Imagine how thrilled we were, a small, very young record label on Canada's (then) sleepy West Coast, to get an email from a kid out in Halifax who claimed to know Lou Barlow and claimed to have pitched him, unbeknowst to us Minters, on putting out a record with us. Well, we were very very thrilled. A few nervous calls to Mr. Barlow later, we had in our hands the master tapes for Another Collection of Home Recordings. 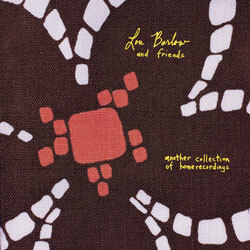 Originally released in late 1994 on both CD and transparent orange double-7", Another Collection of Home Recordings is a mid-length solo release from Lou Barlow of Sebadoh, Dinosaur Jr., and the Folk Implosion. Culled from home tapes made over a period of four years, Another Collection's twelve songs feature the combined talents of Lou Barlow, fellow Sebadoh member Bob Fay, Lou's sister Abby, and a host of others. This record remains the most up-to-date compilation of his solo material from the 90's and features an amazing cover version of Bryan Adams' "Run to You"! Fans of Barlow's highly personal and introspective songwriting will not be disappointed.